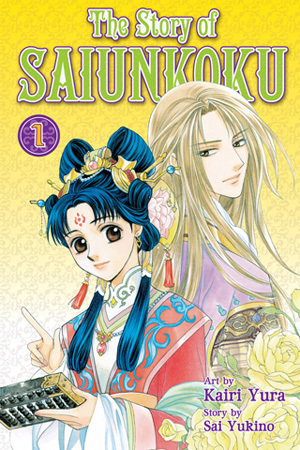 Reads R to L (Japanese Style), for T audiences.Shurei Hong, destitute but of noble birth, has always dreamed of working as a civil servant in the imperial court of Saiunkoku, but women are barred from holding office. The emperor Ryuki, however, refuses to take command, leaving everything to his advisors. Shurei is asked to become a consort to the emperor to persuade the ne’er-do-well ruler to govern.Shurei enters the palace as Ryuki’s consort, but he has yet to seek her out. It is rumored that men, not women, share the emperor’s bedchamber. Shurei must think of a way to stop the emperor from shirking his responsibilities, but she has to find him first!